For at least the past 25 years, our high school has had a closed campus for lunch. Many students, including myself, believe it should become open again. Lunch is a time for students to relax before going to the last two to three hours of their school day. Some argue that because lunch is only 30 minutes long, there is no time to go out and eat. But others disagree since we have so many fast food restaurants that are only a half a mile to a mile away. Some felt like it was unfair we could go out to eat on that day, but not on a regular basis. A lot of people think that our school food is really good and that they would not want to leave the campus to get food, but some others feel like the food is not good at all and some days just won’t eat anything until they can leave to go get their own food. Art teacher Rhonda Sherwin feels it would be a good idea to have more options here on campus. “Why can’t we just have some nice fast food here on campus, like Subway, where students can have their own options?” She said. If there were more options within the school,teachers would worry less about students leaving without permission, and students would not feel as compelled to complain about the food they are served everyday. Many staff members tell us that they don’t think we should have our own open campus, mainly because of time and safety issues. Yet, those same staff members leave on their own to get food during their lunches and many students find that to be hypocritical. There’s no doubt that the parking lot causes a lot of problems for the students and that worries administrators. 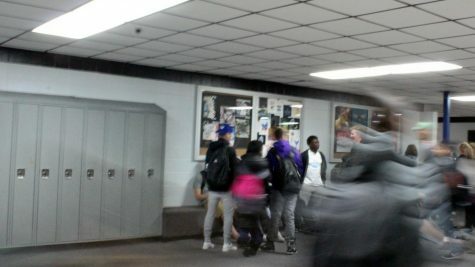 “If they are so worried about accidents during the lunch time, then why do they still risk students driving to school during horrible winter days?” senior Adam Krause said. So many students already leave during their lunch time on their own, and almost all students feel that it shouldn’t be banned anymore. We should just be given time to eat what we want. If lunch were made an open campus, then we would feel less like we are trapped in a building with nowhere to go. What would you like to see done on this site?